Poetry can be such a daunting subject. There is verse, structure, rhyme, and meter. There are sonnets, haiku, limericks, and odes. Then there are the metaphors… oh, the metaphors. 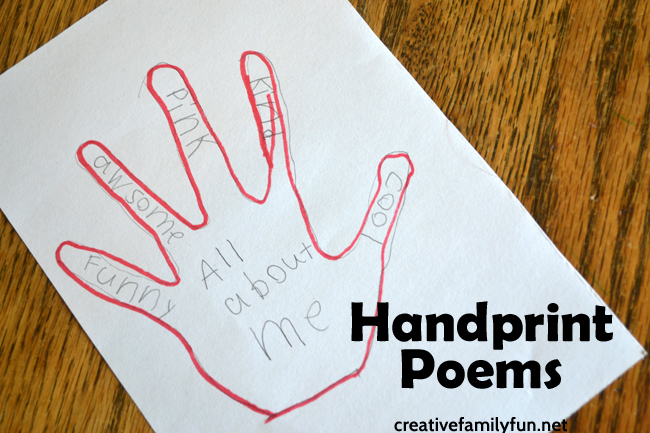 These simple handprint poems are a great place to begin! Despite all the complicated terms, poetry is actually quite easy and fun to enjoy with kids. We’ve also gotten creative and written a few of our own. 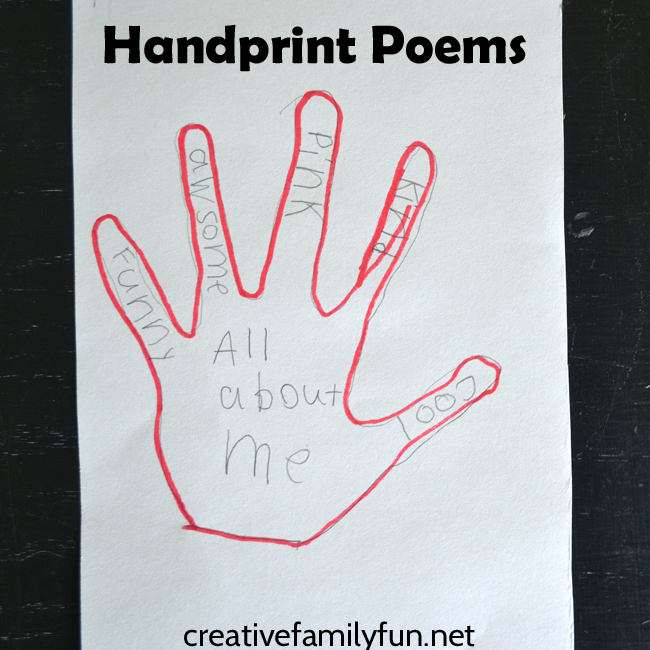 For this project, our poems were quite simple and we used our hand prints as a guide. We started our project by tracing our hands. I cut a white sheet of paper in half so I wouldn’t overwhelm the girls with too big of a piece. I wanted their hand prints to fill the paper and not look lost in the background. The girls then traced their hand print with a marker. Now it was time to write. 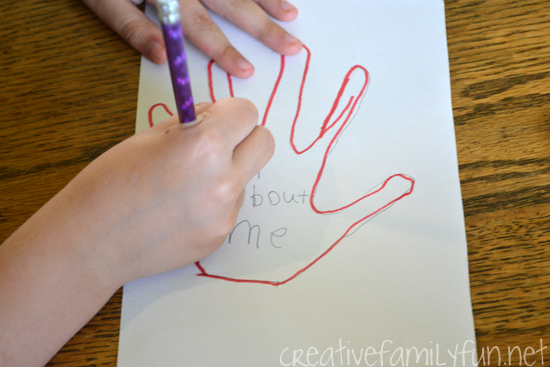 We wrote “All About Me” in the palm of the hands and used the fingers to describe ourselves. Our poems aren’t very formal, and one could argue, not very poem-like. But, that wasn’t the point. Luckily, poetry can be anything you want it to be. My daughter’s poem was short, and at 11 syllables, even shorter than haiku. No matter. It was hers and it was poetry. My daughter’s poem was pretty awesome (and did you catch that she described herself as awesome!). It was simple and it was true. It was any easy way to get her writing and being creative. I loved it! 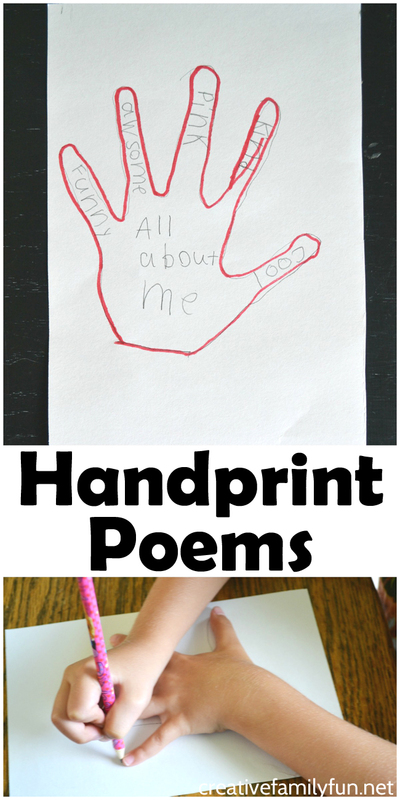 If you enjoyed these handprint poems, the above photo is perfect for sharing on Facebook or you can save the photo below on Pinterest. I agree- poetry can be indtimidating! 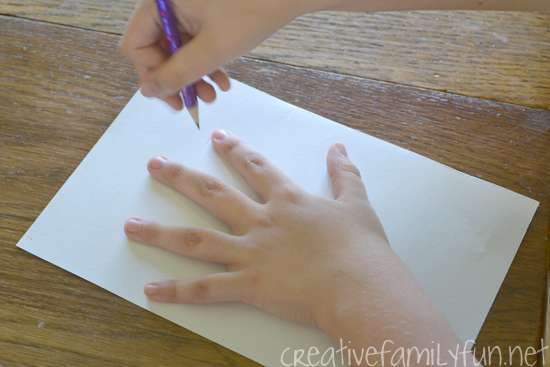 But I love how simple and personal… and easy this activity is! Great idea! Poetry can be intimidating. I love this idea for getting kids into giving it a try! I love this idea so simple but really good at capturing a moment of them. How fun! Our 4th graders wrote auto biographical poems in the first 2 weeks of school following a certain pattern. It was so much fun to read them during back to school night!